Among the activities during Almedalen Week 2018, we had four seminars on four separate subjects. All the seminars were participated in by four different stakeholders: Politicians, Employers organizations, WPHA- on behalf of foreign workers, and lawyers who had great experiences on our perspectives. Besides the seminars we also communicated with the migration minister, the migration agency, ministers of parliament and different labor unions. We look forward to meeting with them again. The seminar discussion gave lots of important information that we think the government and policy makers will consider while they are making decisions about foreign workers issues. For example: long waiting time, strict regulations, very limited rights, inconsistent assessment, unequal treatment between local workers and foreign workers when both are performing under the same labor market practice. During the seminars the reality also came front of the general people that the situation truly affected a lot on us. We believe that we (foreign workers) have great importance in Swedish economy and we contributed a lot for Swedish economic development. However still we are been ignored. During the last three years WPHA has reviewed many cases. All the cases were risking deportation unfairly and many of them had already been deported. This discussion began in 2016, since then we have seen different proposals and regulations. Still lots to be done. We have not seen any protection. Possibility to refrain from expulsion of residence permit if the employer corrects the mistakes related to employment condition by himself before migration board finds it out. We believe that mistakes are unintentional human error and sometime systematic limitation. Thus, both the employees and the employers should given a opportunity for correction. Guidelines from Migration Supreme Court on Overall Assessment. We expect that the concept and interpretation of “overall assessment” should consider foreign workers perspectives. Small or minor mistakes in relation to the condition for work permit. This was supposed to be applied by July 2018. However, due to the presence of the new guideline from Supreme Court (MIG 2017:24 and MIG 2017:25) the Government felt that the application of Ds 2017:64 is no longer necessary. A system in accordance with the labour market practice or policy which is clear enough to be followed by everyone. It is now up to the government to show that they are really willing to deliver, otherwise the problem will never be solved. Johanna Jönsson, Member of Parliament, Center Party. Christina Höj Larsen, Member of Parliament, Left Party. James Savage, Founder, The Local. Matthew Kriteman, COO, Diversify Foundation. Christina Nygren, Professor at Department of Asian, Middle Eastern and Turkish Studies, Stockholm University. We demand a change. A change to be treated fair and equal. 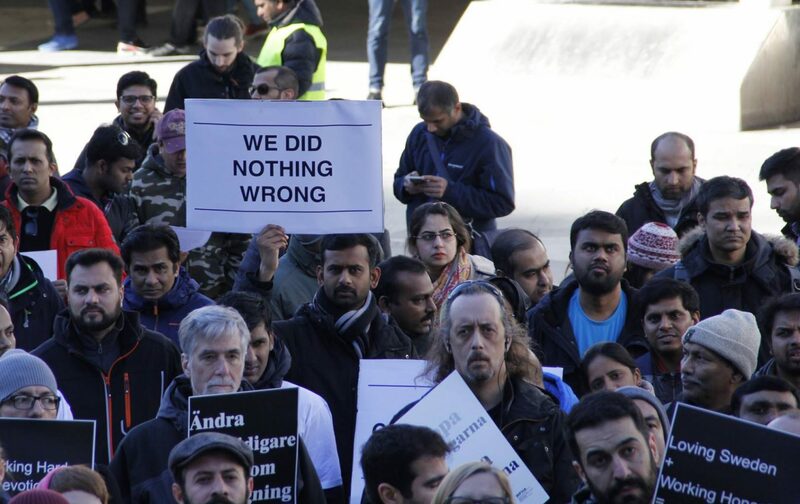 On behalf of foreign workers in Sweden.